NenuFAR is a large low-frequency radiotelescope, partly constructed and in commissioning, but already operational in « Early Science » phase. It is located in Nançay, 200 km south of Paris, France, in the Nançay Radioastronomy Observatory (NRO). NenuFAR will gather at completion 1938 dual polarization antennas hierarchically distributed (Figure 1), of which 1064 are presently in operation. It observes in the 10-85 MHz range, between the Earth’s ionospheric cutoff and the radio broadcast FM band. Most of the antennas are located within a core of diameter ~400 m, except for 6 groups of 19 antennas that will be at distances up to ~3 km. The operating modes and data products are further described below. NenuFAR (New Extension in Nançay Upgrading LOFAR) is a new radioastronomy instrument, operating in the 10 – 85 MHz frequency band, which is in the last stages of its construction at the Station de Radioastronomie in Nançay (France). At completion, the instrument will be composed of a compact core of 96 mini-arrays of 19 antennas each plus 6 distant mini-arrays. Four operating modes will be implemented: standalone beamformer, standalone imager, Transient Buffer mode, and LOFAR super-station. The Comité Scientifique de NenuFAR (NenuFAR Scientific Committee, CSN) welcomes proposals for Key Programmes (KP) using NenuFAR for the Early Science phase of the instrument, from July 2019 to December 2021. During this period, it is anticipated that a total of approximately 8000 hours of observations should be available for KPs. The KP proposals may include any of the standalone operating modes of NenuFAR, or a combination of these modes, but should consider the progressive availability of the observing modes. The LSS mode will be accessed through regular LOFAR calls. For more details, please download the call for Key Programs below. Any member of the French scientific community, and, by invitation, international researchers, may answer this call. The CSN expects proposals submitted by structured teams led by a KP coordinator. However, individuals wishing to join a KP may also apply and should contact the CSN at nenufarcsn@obs-nancay.fr. The deadline for proposal submission is 7th april 2019. NenuFAR will be a hopefully powerful but certainly complex instrument. In order to help the teams to prepare their proposals in the best possible way, and to introduce observers to NenuFAR capacities, operating modes, and data, a 2-day NenuFAR data workshop is organized in Nançay from March 2019, 18th at 2pm to March, 20th at 12 am. All future users of NenuFAR can register at https://nenufar2019.sciencesconf.org/, which will open on January 18th, and preferably before February 10th. Teams that intend to propose a KP are expected to send a least one team member to attend the workshop. Attendance will be limited to about 30 people and the CSN will confirm acceptance after February 11. All dipoles across NenuFAR are (as for LOFAR) aligned at 45° from the meridian, either along the NE-SW direction (so-called NE or X dipoles) or along the NW-SE direction (so-called NW or Y dipoles). Combination of the two linearly polarized antenna signals allows to retrieve the full polarization of the incoming waves (4 Stokes parameters). 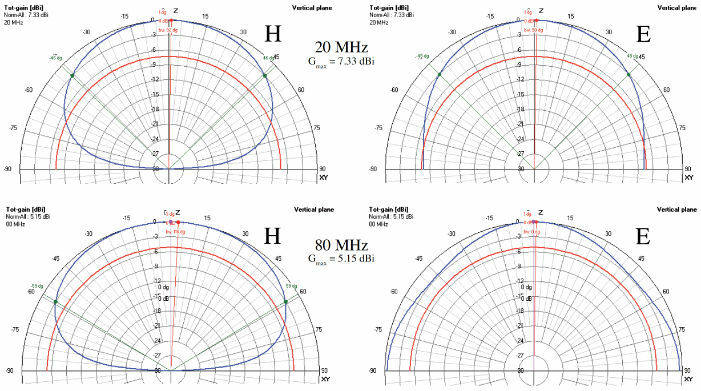 NenuFAR antennas (dipole + grid) have a quasi-isotropic response in the E-plane (perpendicular to the dipole) whereas the gain drops below an elevation ~20° in the H plane (containing the dipole). Antenna response at 20 & 80 MHz in E and H planes. NenuFAR antennas are grouped in hexagonal tiles of 19 crossed-dipoles, hereafter called Mini-Arrays (MA). The elementary mesh of the hexagon is an equilateral triangle of side length 5.5 m (inter-antenna distance within an MA), thus the net diameter of a MA is 25 m (Figure 4). Effective areas of the NenuFAR MA are listed in Table 1. Within each MA, the signals of the 19 antennas (in each polarization) are combined through an analog phasing+summation system in order to form a steerable beam, that restricts the instantaneous Field of View (FoV) but provides higher sensitivity within it. The analog MA phasing system is formed of delay lines (switchable cables lengths) and thus essentially achromatic (the philosophy is the same as that of the square 4×4 tiles of LOFAR-HBA or MWA antennas, except that the hexagonal shape provides – for the same number of elementary delay lines, 10 per MA or per 4×4 tile – more effective area and order-6 grating beams of lower amplitude than the order-4 grating beams of 4×4 tiles). The delay lines are 7-bit systems of switchable cables lengths, permitting to point 27 = 128 discrete directions in the EW direction and 128 in the NS direction, hence a total of 128×128 = 16384 pointable directions in the sky, from horizons to zenith. After analog phasing+summation, each MA delivers two linearly polarized signals (NE and NW) via coaxial cables to the receivers. The analog-phased steerable MA beam has a FWHM of order of λ/D with D~25 m, i.e. from ~8° at 85 MHz to ~46° at 15 MHz (Figure 5). Beam widths and instantaneous FoV at several frequencies are listed in Table 2. Table 1 : Effective areas Ae-dipole, Ae-MA, and Ae-core and Ae-all as a function of the frequency and wavelength. Table 2 : θMA and FoVMA are the beam width (FWHM) and instantaneous Field of View of NenuFAR’s MA as a function of the frequency and wavelength. θcore is the beam width (in beamformer mode) or angular resolution (in imager mode) of the core. θall is the angular resolution of the imager when all MA (core+remote) are used together. Analog-phased MA beams at 20 pointed to the zenith, in linear and dB scales. Cuts are shown at azimuth = 30°, where grating lobes are maximum. Analog-phased MA beams at 80 MHz pointed to the zenith, in linear and dB scales. Cuts are shown at azimuth = 30°, where grating lobes are maximum. 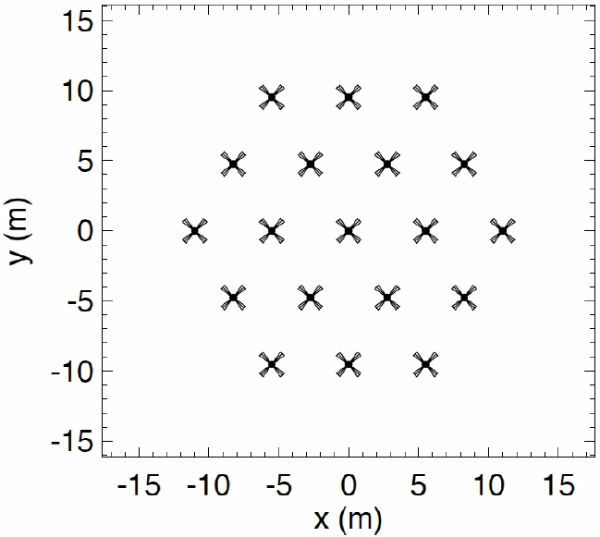 NenuFAR’s antenna field consist of a dense core of 96 MA distributed within a disk of diameter ~400 m (Figure 6), plus 6 remote MA placed to the North-West, East/North-East and South of the core. 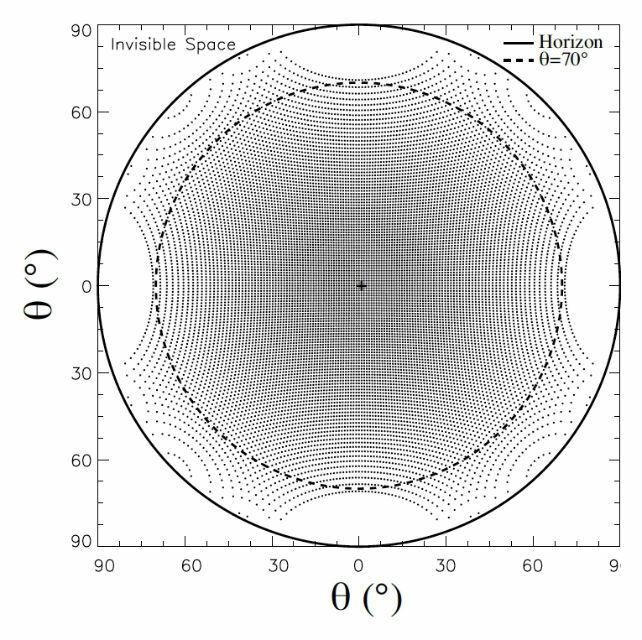 The distribution of core MA ensures a quasi-perfect coverage of the uv plane for baselines between 25 m and 400 m, with Gaussian radial density and uniform azimuthal density, ensuring a Gaussian main beam in Beamformer mode (Figure 7). Remote MA are placed at distances in geometrical progression from the core up to ~3 km, resulting in a good coverage of the uv plane for baselines up to 3 km when combined with Earth rotation during a few hours (and multi-frequency synthesis if allowed by the scientific objectives). The MA are rotated with respect to each other by angles multiple of 10°, in order to reduce the contribution of the side (and grating) lobes when MA signals are summed together. The antennas are back-rotated by the same angle to remain aligned throughout NenuFAR (same polarizations as LOFAR antennas). The rotation angle 0° corresponds to the 5 lines of antennas forming the hexagon all along the EW axis. Rotation angles from 0° to 350° are attributed, that will correspond to rotated local coordinates for each MA. However, due to the hexagonal symmetry, MA rotated by multiples of 60° have the same analog beam responses in the sky. For deconvolution of MA response during imaging, 6 rotation angles only need to be taken into account : 0°, 10°, 20°, 30°, 40°, 50°. All remote MA have the same rotation angle of 0°. Figure 6 : Global MA distribution within NenuFAR, with deployment plan indicated. 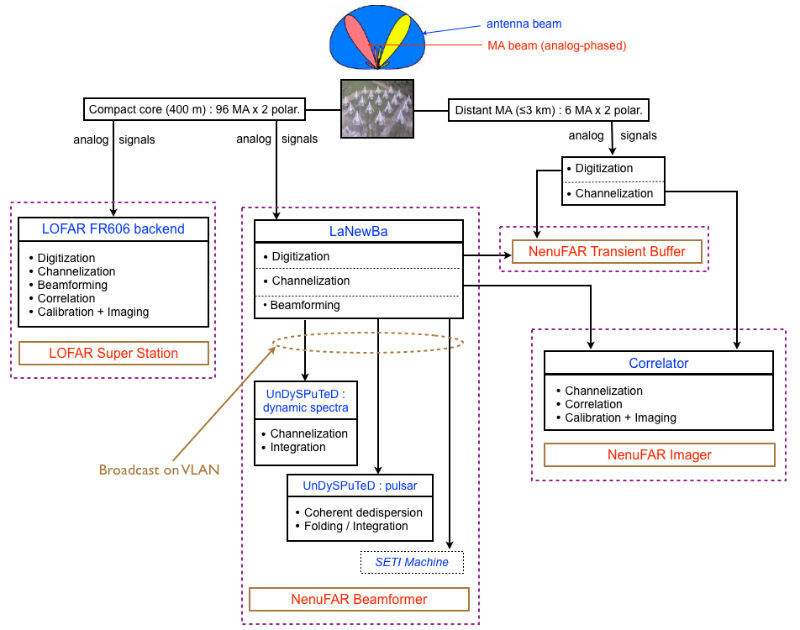 The 96 MA x 2 polarizations analog signals from the core are split in order to feed simultaneously the LOFAR FR606 station backend and the main NenuFAR standalone receiver LaNewBa. 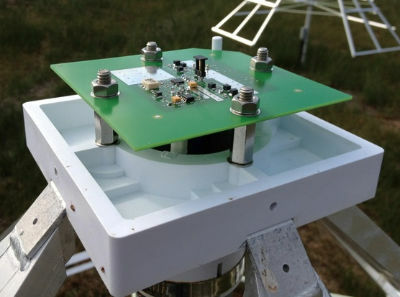 The outputs from the NenuFAR core MA are connected to the 96×2 LBL inputs (not used in LOFAR stations and thus available) of the LOFAR FR606 station, digitized, beamformed, and sent to the LOFAR central correlator as standard LOFAR signals. 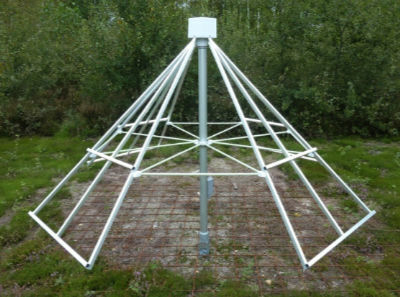 For the use of this LOFAR super station mode, please refer to the LOFAR astronomers page. LaNewBa digitizes each of the 96×2 input signals at a sampling frequency of 200 MHz. The data streams are then channelized in subbands of 200 MHz/1024 = 195.3125 kHz bandwidth each. Beamforming then consists in coherently summing up the complex data streams from all MA for a given subband, polarization and direction (θ,φ) in the sky, after application of adequate phase shifts. A beamlet consists of one subband x 2 polarizations beamformed to one direction in the sky, i.e. it is defined by a triplet (fc,θ,φ) with fc the central frequency of the subband. The raw data stream corresponding to one beamlet consists of 195312 pairs of complex X (NE) and Y (SW) signals values per second. LaNewBa computes and delivers 768 such beamlets at any given time, that correspond to an instantaneous usable bandwidth of 150 MHz. These 768 beamlets can be distributed in (fc,θ,φ) as desired, from 2 beams (θ0,φ0) and (θ1,φ1) with 75 MHz bandwidth (i.e. the full band of the instrument) to 768 beams paving the analog beam (and possibly more) at a single frequency fc, through any intermediate scenario. Cross-correlation STatistics (XST) are interferometric visibilities computed from all MA signals at a rate of one full set of cross-correlations per second within 16 subbands. These statistics data are described in details in the next section (data products). A time-frequency (or dynamic spectrum) mode, in which the signals in each beamlet can be further channelized (up to 64 channels / beamlet, i.e. a spectral resolution ~3 kHz) and integrated (1 ms to 1 s integration), with full polarization information (auto-correlations and cross-correlations of the beamformed NE and NW signal are computed and recorded). A raw waveform mode, in which the raw data stream (195312 pairs of complex X and Y signals values per second per beamlet) is written to disk. A single mode can be used on each UnDySPuTeD calculator at a given time (possibly the same on both if 768 beamlets need to be processed simultaneously in the same mode). A dedicated SETI spectrograph with very high spectral resolution and possibly more advanced functionalities is under study. It will be connected to the VLAN and process in parallel the beamformed data delivered by LaNewBa, enabling piggyback SETI observations parallel to NenuFAR beamformed observations. The digitization boards of LaNewBa include transient buffers that store the last 5 seconds of waveform for each MA (or selected antenna within each MA) and each polarization. These buffers can be frozen and written to disk in response to an external trigger. The NenuFAR correlator (the selection of which is ongoing) will fed by the signals from the 96 MA x 2 polarizations, digitized and channelized by LaNewBa, plus signals from the remote MA digitized and channelized directly at the foot of each MA and send to the correlator without passing through LaNewBa. The correlator will further channelize the signals and compute interferometric visibilities from all MA signals at a rate of one full set of cross-correlations per second within 75 MHz of bandwidth at 3 kHz resolution (384 subbands x 64 channels per subband = 24576 frequency channels). NenuFAR pointing is done in 2 steps : (1) analog pointing of the MA and (2) digital pointing of the whole array. Analog pointing is performed via the MA delay lines permitting to point a grid of 128×128 = 16384 directions in the sky. The grid step is <1° at zenith, corresponding to a gain variation <<1%, and increases toward the horizons (Figure 9). The working interval of NenuFAR corresponds to elevations ≥20°. Not all azimuths can be pointed for an elevation <20°. Furthermore, the instantaneous MA gain pattern is the product of the array term depending only on MA topology, by the antenna response. As a result, the real maximum of the MA gain pattern (when the MA does not point to the zenith) is located at a larger elevation than the maximum of the array term, this elevation is frequency-dependent. This is called the beam squint effect. In order to partly correct for it, the array term of the MA actually points to a pre-defined lower elevation than the desired one if the squint correction is enabled (a reference frequency must be specified). This lower elevation cannot be lower that 20°, due to the above limitation, so that the beam squint cannot be completely corrected for a target (desired) elevation ≤30°. Digital pointing is continuous (grid-free). It is achieved by digital phasing of MA signals before summation (in beamformer mode) or correlation (in imager mode). Analog pointing, and digital pointing in beamformer mode, are locked on round multiples of 10 s, i.e. they occur at min:00 s, :10, :20, :30, :40, and :50 s. This ensures that any RFI or anomaly related to pointing can be easily identified and mitigated. Analog re-pointing of each MA occurs only if the nearest grid position has changed since the previous pointing. Not all MA need to be repointed together, due to their different rotation angles, implying that the grid of Figure 9 is rotated accordingly for each MA, so that the source trajectory through the grid is different for each different rotation angle. Digital re-pointing occurs every 10 s, and causes a gain variation ≤0.5% (≤0.02 dB) as a function of time. Analog pointing is hardware-dependent (delay lines), which implies that a single pointing direction per MA is possible at any given time. Sub-arrays of NenuFAR can be defined with different analog pointing for each sub-array (the default mode is an analog-pointing of all MA in the same direction). On the contrary, digital pointing is software-defined per beamlet, so that up to 768 directions are in principle pointable simultaneously. NenuFAR can work in transit or tracking mode. In tracking mode, the target can be defined by its coordinates (RA, DEC), its name (NenuFAR’s pointing is interfaced with IMCCE ephemeris service for solar system objects, and for the CDS/Simbad database for all other astronomical objects), or a list of coordinates in (Azimuth,Elevation, that follow the Geographic convention – AzElGeo – with origin of azimuths to the local North). When working in transit mode, the analog pointing is fixed to the nearest grid point and the digital pointing is directed exactly to the desired coordinates. When working in source tracking mode, the direction pointed at each re-pointing time (t = min:00, 10, …50 s) is the direction of the source at t+5 s, so that the source path crosses the centre of the beam in each consecutive 10 s interval. Figure 9 : Grid of analog-pointable positions in local coordinates. The suite of NenuFAR receivers delivers/will deliver the following data products (names of data products are underlined. 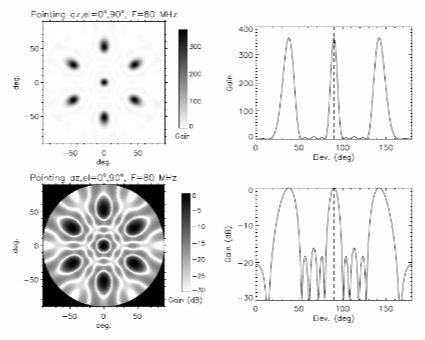 LaNewBa beamformed data is either coherently dedispersed within each 195 kHz beamlet and folded (or not) in known DM and period pulsar mode, or either saved in filterbank/search mode (to enable future exploration of DM-period space). Full polarization is computed within each beamlet. LaNewBa beamformed data in each beamlet is further channelized by UnDySPuTeD (up to 64 channels / beamlet, i.e. a spectral resolution ~3 kHz) and integrated (1 ms to 1 s integration), with full polarization information (auto-correlations and cross-correlations of the beamformed NE and NW signal are computed and recorded). DynSpec data are fully mapped by a quadruplet (t, beamlet # = (θ,φ,f), channel #, Stokes parameter). LaNewBa raw beamformed data stream (195312.5 pairs of complex X and Y signals values per second per beamlet) is written to disk by UnDySPuTeD. similar to DynSpec data product with very high spectral resolution, and possibly more advanced functionalities. The NenuFAR-SETI receiver is under study. LaNewBa beamformed data in each beamlet is integrated over 1 s in X and Y polarizations without channelization narrower than 195 kHz. BST data are fully mapped by a triplet (t, beamlet # = (θ,φ,f), X or Y polarization). NenuFAR BST data are similar to BST data from LOFAR stations. 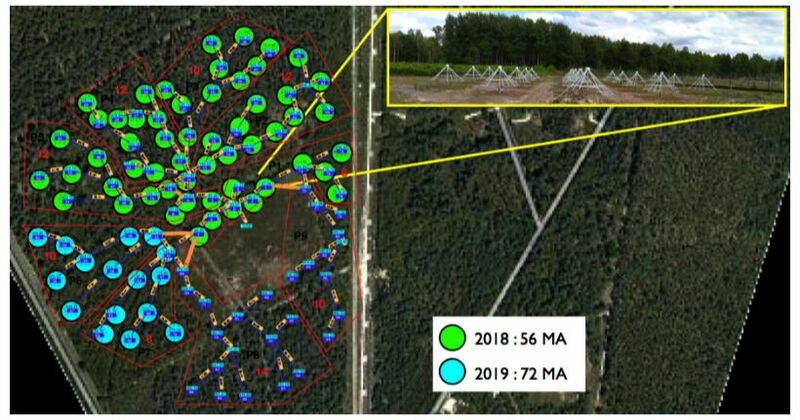 They are systematically recorded in parallel to any other data product during all observations, with the purpose of (i) providing a quick-look of the observation and (ii) providing the observation context in their header (complete NenuFAR setup, active MA, beams, etc.). BST data can be used for science requiring low time-frequency resolutions (1 s x 195 kHz) and no polarization information (X & Y intensities only). They provide the same sensitivity as DynSpec data integrated in the same t-f bins. TO BE AVAILABLE – TBB (Transient Buffer Board) data (proprietary format) : last 5 seconds of waveform from each MA (or selected antenna within each MA) and each polarization (X, Y), frozen in response to an external trigger and written to disk. Visibilities data (MS format) : the correlator will produce LOFAR-compatible Measurement Sets (MS) containing full-polarization cross-correlation matrices in up to 384 subbands (75 MHz total instantaneous bandwidth) channelized at up to 3 kHz resolution (64 channels / subband) once per second. If necessary, up to 4 sets of visibilities per second can be recorded, with reduced bandwidth. 1 MS per subband is written to disk. The phase centre is pointed to by application of digital delays to the signals from each MA. The FoV will be limited by the analog MA beam. NenuFAR Visibilities will be analysed using the LOFAR pipelines. XST (Cross-Correlation STatistics) data (MS format) : LaNewBa computes interferometric visibilities from all MA signals at a rate of one full set of cross-correlations per second within 16 subbands (i.e. 3 MHz bandwidth). No channelization is performed within subbands (spectral resolution of 195 kHz). No pointing is applied (the phase centre is at the zenith). Data is recorded in FITS format. A python program nenums.py is run immediately after acquisition that converts the recorded data in MS format. During the conversion, the data can be rephased to any phase centre in the sky, and MS can simulate the tracking of a (RA, DEC) position, or transit (fixed pointing) at the zenith. The 16 subbands / s can sweep across NenuFAR’s frequency range. 1 MS is written per subband and per 2-hour slice of observation, padded with zeroes at time steps when the corresponding subband is not recorded (in case of frequency sweeping of the observed subbands during the observation). NenuFAR XST data are similar to XST data from LOFAR stations, except that the latter are recorded at the rate of one full set of cross-correlations per second per subband. XST data are recorded primarily for inter-MA phase calibration (permitting to build the calibration table to be loaded in LaNewBa that ensures fully coherent beamforming), but they can also be used for science requiring low spectral resolution (195 kHz) and narrow instantaneous bandwidth (3 MHz / s). TO BE AVAILABLE: They will be used in the NenuFAR-TV (snapshot image of the sky diaphragmed by the analog MA beam, at a rate of ~1 image / min). MS computed from XST will be analysed using the LOFAR pipelines. TO BE AVAILABLE – Visibilities data (MS format) : they will be produced by the LOFAR correlator, with NenuFAR replacing the LOFAR FR606 LBA antennas to increase the sensitivity of long baselines, giving access to more calibrators and better SNR. The MA will be analog pointed to the target during the observation. The data, in MS format, will be identical to LOFAR long baselines imaging data, and processed similarly. 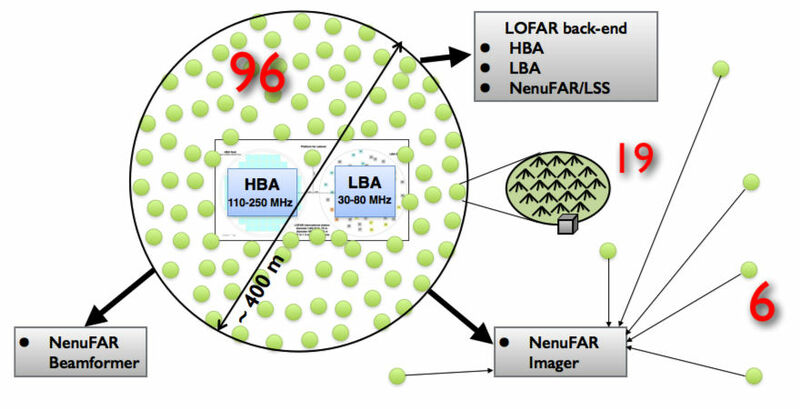 NenuFAR Imager Visibilities can be recorded simultaneously with LOFAR Visibilities in LSS mode, in order to give access to baselines down to 25 m, shorter than the shortest LOFAR baselines of 68 m. The LOFAR and NenuFAR Imager MS can be combined during the analysis. SST (Spectral STatisics) data (FITS format) : they are recorded systematically by LaNewBa during all observations. They consist of spectra of all core MA in X and Y polarizations without channelization narrower than 195 kHz, recorded each second. SST are recorded primarily for engineering purposes (monitoring the response of all MA in both polarizations). They are kept at 1 s resolution for 6 months, and then integrated at 10 s resolution (one full set of spectra per 10 s) before being archived. TO BE AVAILABLE – Incoherent summation data (format tbd) : it consists in the summation of the intensities from each MA (by opposition to the coherent beamformed mode where the amplitudes are summed). LaNewBa can perform this incoherent summation but only at subband spectral resolution (195 kHz). Incoherent summation in narrower channels cannot be performed by the UnDySPuTeD receivers because they are fed by the coherently summed beamlet signals from LaNewBa, while channelization must be performed before incoherent summation. It may be performed by the NenuFAR correlator if the selected hardware allows for it. Pointing of the instrument is shifted from ideal pointing by a 10’ to 20’ shift dependent in the position in the sky. Pointing calibration is ongoing and expected to bring the pointing accuracy down to a few arcmin. Sawtooth level variations of 0.1 to 0.2 dB amplitude may be observed during beamformed tracking observations, related to the above pointing shift. They should be strongly reduced or eliminated after pointing correction. Intermittent broadband RFI can appear around 40 MHz. Its origin is being investigated (windmills ? other ?). NenuFAR measurement set produced via conversion of XST data are compatible with most of CASA suite, most NDPPP tasks, Pyrap/TaQL, WSClean. They are not (yet) compatible with NDPPP SmartDemix, BBS, DDFacet, CASA listobs() & gaincal().The column « corrected data » is not created by default (to save space). It is created automatically at calibration (e.g. with NDPPP). Sensitivity, FoV, Resolutions : plots and calculator in Python and IDL will be provided. Graphic User Interface for the programmation of the observations and monitoring of the data. Calibrators : A-team sources are used for phase calibration of the beamformer mode and flux calibration of the beamformer and imager modes. Instrument simulations : Python and IDL tools will be provided. Coupled to a Global Sky Model, they allow to simulate and interpret the expected response of the beamformer. Data volume : a calculator in Python and IDL will be provided. Data storage and processing : data will be stored by default on the Nançay data centre, that will provide long-term archiving as well as some processing capabilities (nancep computer nodes). IDL and Python software packages will be provided for reading and basic processing of beamformer data. 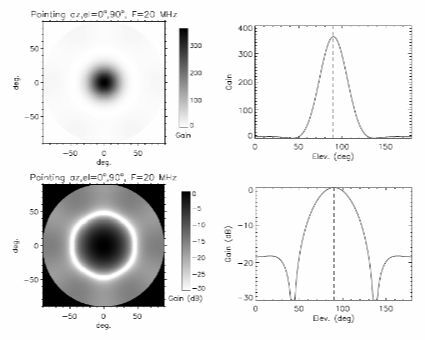 The LOFAR pipelines & tools (NDPPP, BBS, KillMS/DDfacet …) can be used to process imager data.